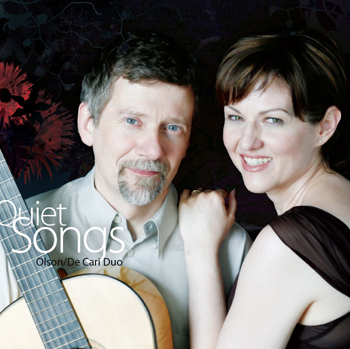 Olson/De Cari Duo — A husband-and-wife ensemble dedicated to expanding the repertoire for classical guitar and voice, deriving inspiration from their eclectic backgrounds in both science and the arts. Their first CD, Quiet Songs, features Baroque and twentieth-century repertoire for solo guitar and guitar and voice. Their new recording, Eve's Diary, will be released October 12, 2018, and will feature new compositions and arrangements written for the Duo, by David Leisner, João Luiz, Frank Wallace, and Clarice Assad. Brooklyn Guitar Quartet — An ensemble of four experienced classical guitarists, dedicated to exploring contemporary, classical and popular repertoire. Recent recital programs have included transcriptions of piano music by Felix Mendelssohn and contemporary works of Leo Brouwer, as well as popular Brazilian rhythms by Paulo Bellinati. The quartet's aim is to communicate with its audience by choosing repertoire that is accessible while remaining substantive as works of sounding art. Contemporanea Guitar Duo — A collaboration with guitarist Isabella Abbonizio, dedicated to performing vibrant and engaging contemporary repertoire for two guitars, with an emphasis on twentieth- and twenty-first century European music. New York City Guitar Orchestra — A performing collective that unites all levels of musicians with a passion for exploring ensemble music in the unique context of the guitar orchestra. Established by the New York City Classical Guitar Society and directed by Jason Sagebiel, the NYCGO is a welcoming and professionally-run organization dedicated to providing valuable ensemble experience for guitarists of diverse backgrounds, while maintaining musical excellence and a commitment to fostering the creation of new music. For more information about the Olson/De Cari Duo, visit olsondecariduo.com. To purchase the first Olson/De Cari Duo CD, Quiet Songs, click below. For more Brooklyn Guitar Quartet videos and information about the ensemble, visit brooklynguitarquartet.com. For more information about the Contemporanea Guitar Duo, visit contemporaneaguitarduo.com. For more information about the NYC Guitar Orchestra, visit guitarorchestra.nyc. Photo credits, top to bottom: NYC Guitar Orchestra ensemble by Gioia De Cari; Olson/De Cari Duo by Simon Powis; Brooklyn Guitar Quartet by Gioia De Cari; Contemporanea Guitar Duo by Roberto Pieraccini; NYC Guitar Orchestra by Bruce Parker.